For the Marqués of Albaserrada, it is critical that his passion be explained and demonstrated. Mirandilla, hospitable, pleasant and forthright, shares with its guests the daily life of the bull in its natural environment. The men and women who take care of the bulls will manifest the love and respect that one feels towards these magnificent beasts. Without ever losing authenticity, the Marqués offers guests the opportunity to discover the animals at close proximity from a tractor-pulled trailer, or by watching a ‘tentadero’ or visiting the museum that recounts the bull-breeding history of the property. 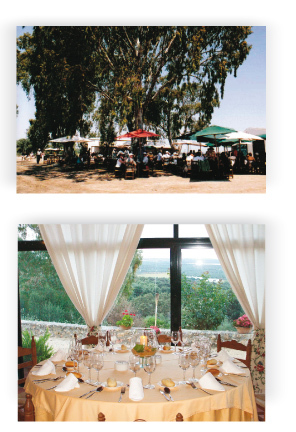 In the rustic rooms of the homestead are also hosted dinners in the purest tradition of andalusian gastronomy. With Sevillana music, so apparent in the festive andalusian daily life, happiness and spontaneity are brought to these moments.